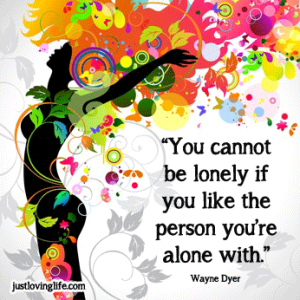 I read this quote today by Wayne Dyer and it immediately grabbed me because I know a lot of people who just can’t be on their own – not even for 5 minutes. When they find themselves on their own they begin to feel either bored, lonely, panicky, scared or all of the above. To give just one example, I remember watching a TV program where they were renovating a house and the husband mentioned how he had to build an open bathroom as is wife couldn’t have a bath without having him around to talk to. I am the opposite. I personally love being on my own. Have you ever heard people tell you that they are lonely in a crowd of people – that’s pretty much what I experience. I don’t mind being with people – I can enjoy their company and have a great time. But oftentimes to me it is very draining especially when I am around people that just constantly chatter about nothing in particular. By the end of the outing I just want to go home, relax and tune out. We are all different and all experience different things but I just thought that Wayne Dyer’s quote hit the mark. Essentially he is saying that if you have difficulty just being alone with yourself then you probably don’t like yourself very much. You have to like yourself to enjoy being in your own company. What you need to do is to figure out what makes you not like yourself and the answer to this is pretty much the same for everyone. You don’t like yourself because at some point in your life you started to believe what other people have said about you. It’s nothing more than that really. Maybe someone once told you that you are ugly, your choice was either to choose to believe them or not believe them. If you agreed with what they said then you will believe that you are ugly. And that creates a cycle in your life where you start to attract people who think you are ugly and you believe them as well…and on and on it goes. You have to remember that everyone has a different opinion about things. Just imagine for a moment that you have 10 people in a room – you might have your mom, your cousin, a couple of friends, a work mate, a neighbor and some random strangers you grabbed from off the street. What do you expect to be the response? Do you really think that they will all give the exact same answer? Your mom might say: “To me you are truly beautiful and always have been.” Mom’s do that. So which one of those people is correct? Well the thing is they all think they are the one telling the REAL truth and they could easily argue with each other until they are blue in the face about whether you are really ugly or not. It is because each of those people have their own beliefs about what is beautiful or ugly and they truly believe those beliefs. Some have been brought up to believe a spider is ugly and something to be feared whilst others have been brought up to think that they are absolutely awesome. So who is really speaking the truth? The answer to that is simple…they are all speaking the truth because it is the truth for them. On the other hand, they are also not speaking the truth because in reality a spider is just a spider. If you say it is ugly or awesome that doesn’t change the spider – it’s just a spider. It’s only your thoughts that change it for you. So if we get back to the question we asked and the responses we received, how do we know which person is actually telling the truth about whether you are ugly or not? Now if you consider the statements about the spider then you will realize that the same applies to you, so you can’t really say who is telling the REAL truth – because it is simply their truth. Everyone has a different opinion and they each believe that to be reality – it is your choice as to which reality you want to believe. Unfortunately it’s human nature to always choose the most negative option and once we agree with someone’s low opinion of us then it tends to become our belief. Once you become aware of this you suddenly realize that the beliefs in your head may not actually be true. This is so empowering as this realization allows you to start changing your thoughts so that you can begin to create new ones. It’s not easy but by just being aware that your beliefs are not necessarily true can open up a whole new world to you. Forget the beliefs and opinions of others where you are concerned and change your thinking to believe how beautiful, intelligent, clever and talented you are and your life will improve in a myriad of ways.